Two more books this week which tie in to DC’s Lantern ring giveaway. Adventure Comics was launched when the most recent Legion of Super-Heroes series came to an end. 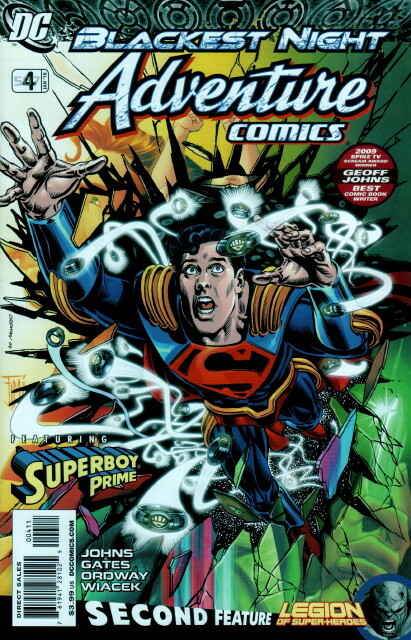 Its lead story features Superboy (the Connor Kent/Teen Titans version), and its backup features the Legion – the “classic” team which Geoff Johns reintroduced in Action Comics and Legion of 3 Worlds. I decided not to follow it along because I have no interest in this incarnation of Superboy. Oddly, the lead story here is draw by Jerry Ordway, and not regular artist Francis Manapul, so as much as I like Ordway (although this isn’t his best stuff) it doesn’t give me any feeling for what the series has really been like. Plus, this issue doesn’t actually have much Superboy, but rather brings back Superman-Prime, the insufferable villain who finally got his comeuppance at the end of Legion of 3 Worlds. Honestly if I never see Prime again, it’ll be too soon. The backup features two Legion characters who have been torn apart by the events of Lo3W, and getting back together with a little assistance from two other star-crossed lovers on the team. It’s a nice character story in its way, but it feels more like the beginning of a larger arc than just a backup tale. If Adventure Comics were all Legion, then it might be worth following, but just the backups isn’t enough to get me back on board. The other half of the story involves Katana being waylaid by her dead husband and children, and is more routine angst/combat stuff. But Fernando Pasarin’s pencils are quite good, making this a pretty solid read overall. The only downside is that it doesn’t give me – a new reader brought in via the ring giveaway – much orientation for who these Outsiders are, why they’re outsiders, or what their organization is like. But of all the Blackest Night tie-ins, this is the one I’m mostly like to give another shot. 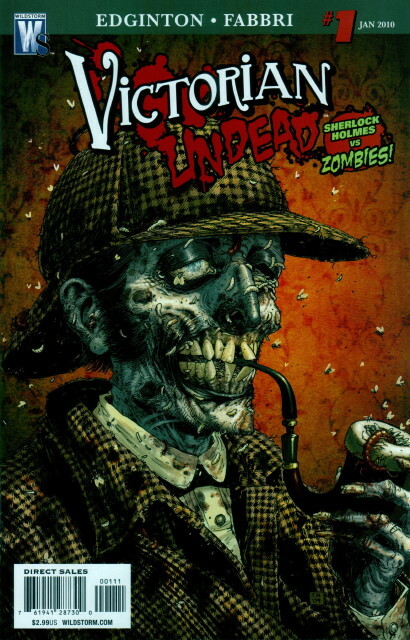 Ian Edginton wrote the terrific Scarlet Traces about what happened to England and Earth after the defeat of the invaders in The War of the Worlds, so even though I’m suffering a bit of zombie exhaustion, I was willing to give him the benefit of the doubt and check out Victorian Undead, which as you can see from the cover involves Sherlock Holmes and zombies (although contrary to the cover, Holmes is not himself a zombie). The premise is that a meteor shower in the 1850s led to the rise of zombies in London, and in the 1890s Holmes and Watson have to grapple with their emergence (or maybe return – the timeline is left deliberately blank as I expect it’s one of the mysteries to be explored in the series). Edginton injects some serious steampunk – in the form of a humaniform robot – into Holmes’ milieu, on top of the zombies. This first issue is entirely set-up, with shadowy governmental figures trying to keep a lid on things. I’m sure we all know how well that will work. Whether or not we’ll see other Victorian-era icons, I don’t know. Davide Fabbri looks like a decent artist, although with just enough of overtones of an Image style (gratuitous lines, unnecessary flourishes) for me to not fully embrace his style. But overall the series gets off to a good start, if you can stand another zombie title. Hopefully Edginton has more in mind than just “Sherlock Holmes and zombies”, though, because I don’t think that’s enough to carry the series. Zombies, after all, have been done before. I gushed a few months ago about the first hardcover collection of Bob Layton’s Hercules mini-series from the 80s. 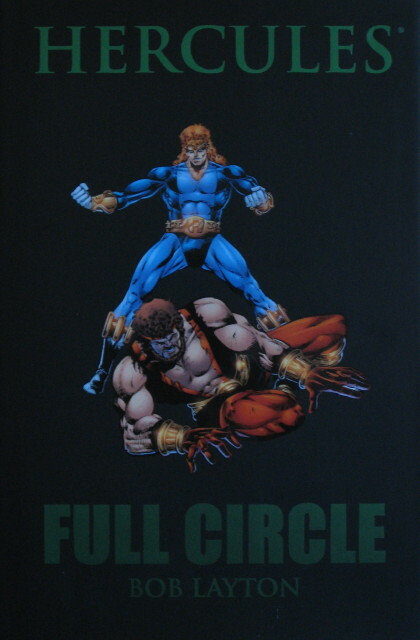 This month we get the second collection, containing the “Full Circle” graphic novel which concludes the character’s story, plus a short story and a 3-part epilogue that I hadn’t read before. Layton’s art seems more than a bit dated today, but some of the stuff he tries to put over on the reader is amusing just for its audacity (like the supporting character “Lucynda Thrust”), and it works completely as a lighthearted buddy story. I doubt it’d be for everyone’s taste, but I’ve always loved it. I was very reluctant to pick up anything related to Realm of Kings considering what a bust War of Kings was, but something made me buy this one-shot. I’m glad I did, because it’s a neat little story: Quasar goes through the rift opened at the end of the war, and ends up on a parallel Earth in which the Avengers have given themselves over to the Great Old Ones, and who are interested in extending their reach into Quasar’s universe. 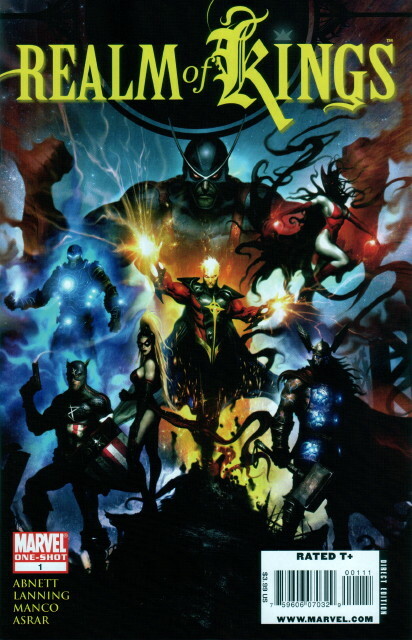 While an obvious twist on the whole Marvel Zombies thing, the notion of the superheroes corrupted into becoming dark magicians could have legs. Then again, maybe it would be less entertaining if stretched out too far. Leonardo Manco does a great job drawing the corrupted Earth and its heroes, and Abnett and Lanning have fun with the dark heroes (“What the Ftaghn?” exclaims Ms. Marvel) and figuring out how to get Quasar back where he belongs. As one-shots go, this one’s a lot of fun. Whether or not any of the rest of Realm of Kings – a collection of mini-series – will be, I have no idea, but as they mostly feature characters I don’t care about (the Inhumans, the Imperial Guard), I doubt I’ll give it more than a passing glance. Wake me when the main heroes get involved. It’s time to check back in on Terry Moore’s Echo. It’s been slow going, but the story has been gradually revealing itself. Our heroine, Julie, accidentally got covered with a metallic substance which gives her odd powers she can’t really control, mainly being able to shock people with an energy zap. 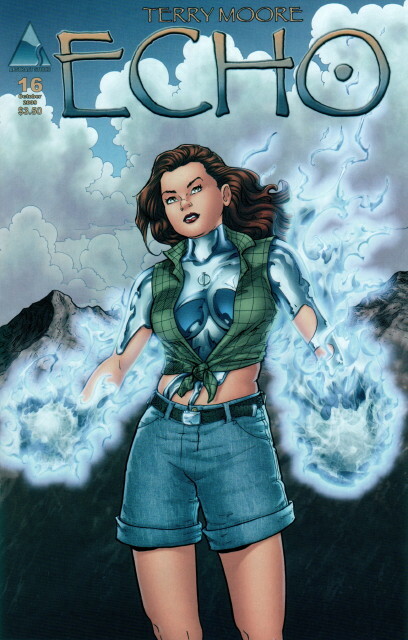 The creators of the metal have been after her, including hiring a mercenary Ivy, to bring her in. Julie’s also encountered a man – apparently a vagrant – who also has some of the metal, resulting in destruction and some death when they meet. After being on the run for some time, Julie’s gone with Ivy – who’s turned on her bosses and also retrieved Julie’s mentally-disturbed sister Pam – and is hiding with her. That’s a lot of story, but it hasn’t felt like that much while reading it. It’s mostly felt like a fairly routine chase/suspense story with the mystery of the metal lurking in the background. What seems to be revealed here is where the title “Echo” comes from, as Julie is wondering if she’s able to communicate with the last – and deceased – wearer of the metal, a woman named Annie. There are also indications that Julie’s role may take on messianic overtones. I can’t say that Echo has been one of my favorite comics – the glacial pace made me drop Moore’s previous series, the popular Strangers in Paradise – but it’s been interesting. Whether it’s all worth it will depend on whether Moore is able to bring it all to a big finish, whenever that comes. After a fashion, Echo reminds me of Jeff Smith’s current series, RASL in its tone, suspenseful structure, and fantastic mystery. To his credit, Moore has been publishing Echo nearly monthly, which makes it easier to stay attached to. And I like how Moore’s art has developed better than the caricature-dominated art Smith brings to RASL. It’s a little odd that after 16 issues Echo is still at the point where it has more potential and actuality. Hopefully over the next year Moore will kick it into gear and turn it into something unique and exciting. But it’s not quite there yet. We’ll probably never know what Steve Gerber had in mind for the conclusion to his Doctor Fate story in Countdown to Mystery before he died. Four 4-page entries written by four different writers probably wasn’t it, and consequently the story comes to a rather abrupt end (several of them) with none of the delicacy it really required, as Gerber was always walking on the knife-edge of making the thing work anyway. Of the four, Mark Evanier’s version feels most true to Gerber’s style, while Gail Simone’s feels the least. But all of them are too short, too simplistic. Gerber’s writing has always (well, that I’ve seen) had a strong psychological component, not only having quirky characters but exploring what their quirks mean and where they come from. Although this facet of his work was often the most uneven part, it’s also a tack that few other comics writers ever take, and unfortunately what there is of that facet in these four endings tends to be far more heavy-handed than Gerber would have used. It’s not really anybody’s fault, and I appreciate that DC and the four writers wanted to pay a little tribute to Gerber, but I think the story and the readers would have been better served to have picked one ending and done that one the best they could. Ah well. The other half of the comics, the Eclipso yarn, ended up being slightly more meaningful than I’d expected, comparing the similarities between Eclipso and the Spectre. 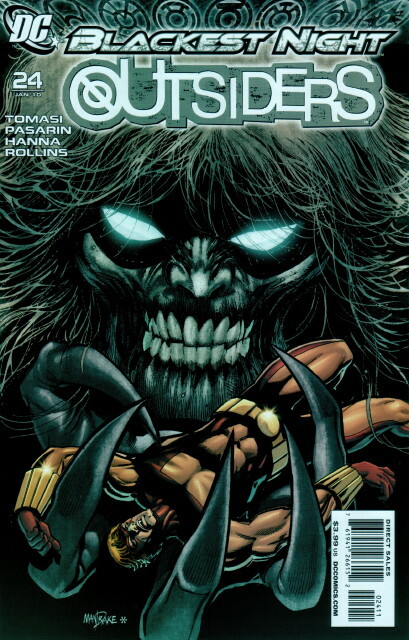 The thing was still pretty superfluous, though, as nearly everything tied in to Countdown to Final Crisis has been. Just think: If DC had gone with Plan A and just done a Doctor Fate mini-series (which they had solicited and then cancelled), we could have avoided this whole Eclipso rubbish and Gerber might have been able to finish the story in his lifetime. Sheesh. Things really pick up in the third issue of Echo, which encourages me enormously: We find out something about ‘s family, and why her husband is divorcing her. We find out something about the metal suit that’s partially grafted itself onto her body. And there’s an odd scene at the end which I expect will be explained in the coming months. Suddenly this is feeling like a much less generic indy comic. Which is good. Matt Wagner’s Grendel series is one of my favorites. It didn’t start out that way, though, as its first volume, Devil by the Deed concerned a crime lord named Hunter Rose. Wagner has revisited the Rose character from time to time, but I’ve pretty much given up on those, as it’s the least interesting slice of the Grendel story. Much more interesting are the stories which concern how Grendel – a spirit of aggression – affects the history of Earth over the next few hundred years, expanding from profoundly affecting a few influential individuals, to eventually helping to craft a global empire under the rule of Emperor Orion Assante several hundred years from now. This volume, Devil Quest, takes place several generations after the excellent War Child story – which is about Orion’s son, Jupiter – concerning several interested parties trying to locate the Grendel cyborg who had helped Jupiter establish his own rule after his father died. The cyborg Grendel-Prime is on his own mission trying to strengthen the Empire, too, and his quest leads directly into the second half of the Batman/Grendel volume (the better half, as the first half involves Hunter Rose meeting Batman). Written and drawn by Wagner, the art is superb. The story is eccentric and sometimes violently brutal, which I think is intentional; Wagner was trying to shock and push the envelope a little. Unfortunately it also comes to an ending which feels unfinished – even with the Batman story factored in – which makes it a disappointing read in total. Though the trip to get there is quite interesting. Anyway, I did enjoy it enough to pick up this new hardcover collection. But your mileage may vary. I keep waiting for Wagner to do another Grendel sequence carrying the future history beyond this volume, but it seems like Wagner’s done as much as he plans to with the tale and he’s otherwise just poking around in the side corridors of the earlier stories, which doesn’t interest me as much. Alas. “Assignment: Earth” was an episode of the original Star Trek series which was intended as a pilot for a new TV series. The series didn’t sell, which isn’t surprising because it was a pretty wan, unimaginative episode. Nonetheless, IDW’s current renaissance of Star Trek comic books has resulted in a series based on the episode, written and drawn by John Byrne! As he’s done elsewhere, Byrne is using an unorthodox storytelling technique of having each issue take place a year later than the first one. Although not everything Byrne does works for me, I do usually enjoy his stories which are structurally adventurous like this, so I was moved to buy it. It’s not bad, although it doesn’t go much past the TV episode. But then, it’s basically trying to lay the groundwork for the overall arc, which will I guess run through about 1980. He obviously has a lot of fun writing Roberta Lincoln (the Teri Garr role), as well as drawing Gary Seven (the Robert Lansing role) whose character he expands a little bit here. So it’s a decent start, and I’m curious to see where Byrne goes with it. Comic books I bought the week of 5 March 2008. Terry Moore made his name in comics in the 90s with his long-running series Strangers in Paradise, which was a sort of female buddy comic with a big helping of romantic tension on the side. The original mini-series was moving and hilarious, with just the right amount of implausible lunacy to make it exciting without being ridiculous. It then launched into an ongoing series, which frankly lost me pretty quickly: The grim details of Katchoo’s past, the endless and tedious introduction of the main antagonist, it wasn’t funny, and it quickly ceased to be fun, and I stopped buying it about 12 issues in. Having wrapped up SiP last year, Moore is now back with Echo, whose first issue came out this week. Like – it seems – a lot of first issues these days, not a lot happens in this one; rather it’s some very broad set-up with “uncompressed” storytelling. It opens with a woman apparently test-driving a high-tech flying suit – which is somehow nuclear but looks like shiny metal – when her controllers double-cross her and hit her with missiles. The suit fragments and rains pieces onto our presumptive heroine, Julie, a photographer who, we learn, lives alone with her dog and whose husband is divorcing her. The largest remaining piece she finds attaches itself to her skin – and the issue fades out. So, lots of questions: Who’s conducting the test? What does the suit do? What will it do to Julie? Why’s the book called Echo? Will it at all resemble the long-ago Peter B. Gillis/Kelley Jones series Chrome? (I’m almost – but not quite – the only one who remembers that series, it seems.) All things considered, it’s way too soon to tell. Fortunately, Moore’s art is as good as it was ten years ago – maybe better. Will I like it better than I did SiP? I hope so.